Summer Kale Salad | A Bushel of What? Let me preface this post by saying you might find the following salad recipe unusual. I had been trying to think up a quick kale recipe that I could make when the weather was hot. I wanted something more interesting than kale with lemon and olive oil, or kale and beans, or kale and sausage (although, I do recommend my Kale and Spicy Italian Sausage recipe for when the weather is cool or rainy) and I wanted my kale cold. Yes. I wanted to eat my kale chilled and crispy. I decided to start with blanched kale. Because I think kale tastes somewhat sweet when blanched, I tried to think up something that would be crunchy and tart to add to the dish. I also wanted to add a creamy, salty flavor that smoothed out the sweet and tart, but still added a little oomph. Ready for the big reveal? Here goes: Kale, Pickled Red Onions, and Feta. You may be scrunching up your nose right now, but hear me out and give this recipe a try. 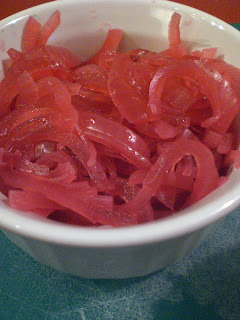 Actually, you get three recipes in one post, because David and I had a bit of a pickled onion cook-off on Sunday morning and although both of our recipes were tasty, he won the challenge. His onions were less spiced and pared better with the feta and the kale. My onions turned out more relish-like, which I imagine would be delicious on roasted pork loin, or a hot dog, or something. I'm actually pretty excited about this and I plan on using my new onion relish in the near future on a sandwich. I will also revisit this recipe when onion season is upon us, as I'd be interested to use multiple types of onions in this recipe. Bring water to a boil in a large pot. Add the kale and return to a boil for 2 minutes. Immediately remove the kale and submerge into a large bowl of ice water and let sit until kale is completely cooled. Use a salad spinner or drying method of your choice to dry the leaves. 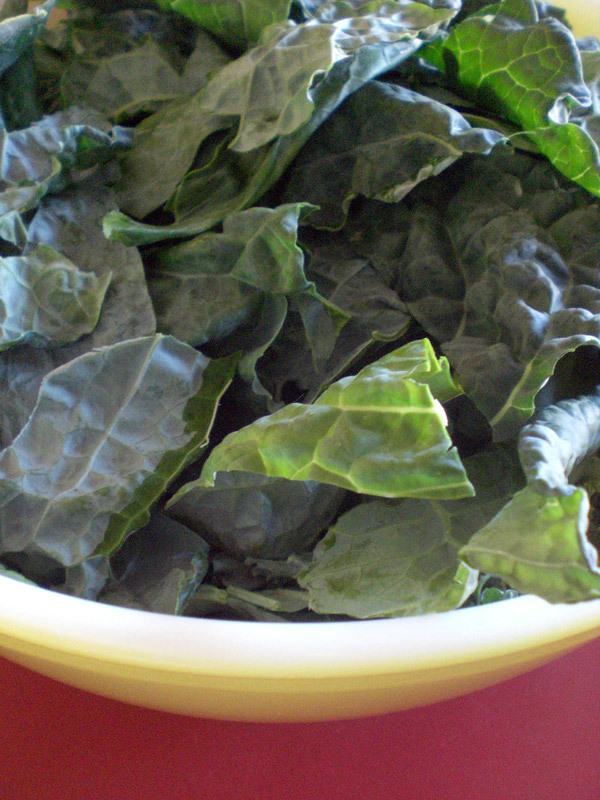 Place in a bowl large enough to toss the kale with the other ingredients. Add the onions and feta to the kale and squeeze the lemon wedges over the ingredients. Toss to combine, allowing the feta to break up and coat the kale. Allow salad to sit for 30 minutes before serving. Season with salt and pepper to taste, if necessary. This salad's best the day it's made. I plan on enjoying it next time with some grilled chicken. Bring the first 6 ingredients to a boil in a medium saucepan to form a brine. While wating for the brine to heat up, place the garlic in the bottom of a large mason jar and then pack the onions on top of the garlic. Once the brine boils, turn off the heat and pour the mixture into the jar with the onions and garlic. Tighten the lid on the jar and let sit until the onions have cooled. Refrigerated, this will keep for a few weeks. 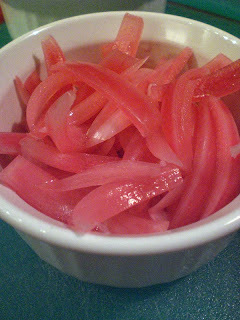 1 lb red onions, trimmed, peeled, halved, and then sliced very thinly to form half-moon slivers. In a small saucepan, bring everything except the onions to a boil. Remove the saucepan from the heat and add the onions. Cover the pot and let rest for 20 minutes. Remove the cinnamon stick and bay leaf and pour the onions and brine into a mason jar for storage. Let the jar cool to room temperature before placing in the refrigerator, where the relish will keep for a few weeks. I love kale chips! I put them in a lower heat over (275) and spritz them first with olive oil. Then, after I take them out of the oven I sprinkle nutritional yeast on them. Any ideas on how to get this sort of pickled onion to keep longer? I admit I just stick them in the fridge and keep using until I run out even if it's far longer than a few weeks, but it seems like there should be a way to properly can and preserve them, no? I suggest visiting http://www.freshpreserving.com/ for info on hot water bath canning. I would imagine that canning onions is just like canning dill pickles since both are preserved in vinegar, thus making the processing time short and sweet. If you're ever in the market for a good pickling book, I would suggest The Joy of Pickling, by Linda Ziedrich. I'm afraid that processing these might screw with the texture - and I actually don't even process my dill pickles despite storing them at room temperature once they've sealed. (I start with sterilized jars, pour boiling brine over the cucumbers, put on lids and bands and wait for them to seall, though.) but that's a recipe from at least a generation or so back, and I wouldn't just try it with any old food pickled in vinegar. This is a great recipe. The relish is something not usually seen around as it relates to a regular home cook so I enjoyed this post and thank you for sharing with the masses. Turning Over A New (Lettuce) Leaf?